1. Choose Lists → Chart of Accounts. Or click the Chart of Accounts icon on the home screen. 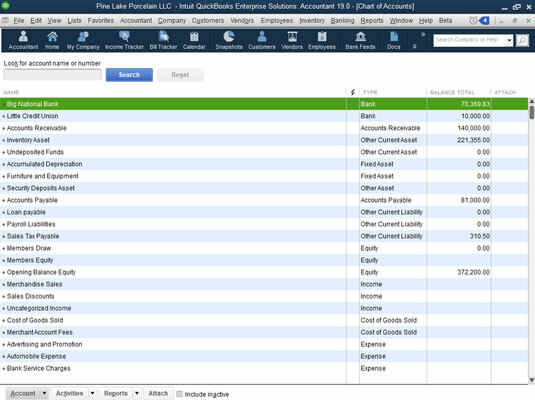 QuickBooks displays the Chart of Accounts window, as shown. The Chart of Accounts window. 2. Click the Account button in the bottom-left corner of the Chart of Accounts window and then choose New from the drop-down menu. QuickBooks displays the first Add New Account window, which simply displays a list of option buttons corresponding to the different types of accounts QuickBooks allows. 3. Select the Credit Card option. Selecting Credit Card tells QuickBooks that you want to set up a credit card account. I’m sure that you’re surprised. Click Continue. QuickBooks displays the second Add New Account window, as shown. The second Add New Account window. 4. Type a name for the account in the Account Name text box. Why not do it right? Move the cursor to the Account Name text box and then enter the name of your credit card. 5. Type the card number in the Credit Card Acct. No. text box. If you’re creating a general credit card account for more than one card, leave the Credit Card Acct. No. text box empty. While you’re at it, you can describe the card, too. You may want to type Usury! in the Description text box, depending on your card’s interest rate. 6. Click the Save & Close button. QuickBooks redisplays the Chart of Accounts window. Now the window lists an additional account: the credit card account that you just created. To tell QuickBooks that you want to work with a credit card account, you use the Chart of Accounts window. Choose Lists→Chart of Accounts. After you display the window, double-click the credit card account that you want to use. 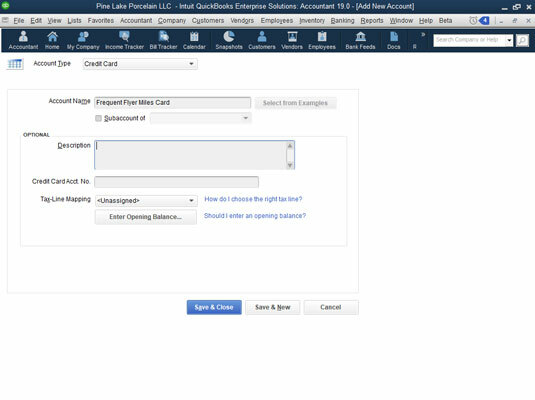 QuickBooks displays the Credit Card register so that you can begin recording transactions. As an alternative to the Chart of Accounts window, you can click the Enter Credit Card Charges icon in the Banking area of the home screen. Or you can choose Banking →Enter Credit Card Charges.